Amaryllis L., Sp. Pl. 1: 292. 1753. nom. cons. Type species: A. belladonna L.
Liliago Heist., Beschr. Afr. Pfl. 32. 1755. nom. illeg. Lilionarcissus C.J.Trew, Hortus Nitid. 1: . 1768. nom. illeg. Amaryllis subg. Belladonna Sweet ex Endlicher, Gen. 176. Jun 1837. Belladonna (Sweet ex Endlicher) Sweet ex W.H.Harvey, Gen. S. African Pl. 337. 1838. Belladonna Sweet, Hort. Brit., ed. 2. 506. 1830. Coburgia Herb., Bot. Mag. 47: t. 2113. 1819. Linnaeus, C. 1753. Species Plantarum, Tomus I: 292.
International Plant Names Index. 2017. Amaryllis. Published online. Accessed 21 Mar 2017. Govaerts, R. et al. 2017. Amaryllis in World Checklist of Selected Plant Families. The Board of Trustees of the Royal Botanic Gardens, Kew. Published on the internet. Accessed: 2017 Mar 21. 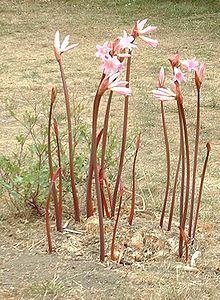 For more multimedia, look at Amaryllis (Amaryllidaceae) on Wikimedia Commons. This page was last edited on 11 April 2019, at 15:58.